Carlyn Montes De Oca ,L.Ac., Dipl.O.M., M.T.O.M., USA. "The Animal-Human Health Connection & Beyond"
We are delighted to announce and indeed welcome Carlyn Montes De Oca, L.Ac.,Dipl.O.M, M.T.O.M to the conference as one of our esteemed Keynote Speakers from the USA who is speaking on " The Animal-Human Health Connection and Beyond". Carlyn Montes De Oca’s presentation will discuss that while we may love animals, we don’t often see them as the powerful health and wellness allies they are, with the potential to transform our lives. As the award-winning author of “Dog as My Doctor, Cat as My Nurse; An animal lover’s guide to a healthy, happy, and extraordinary life,” Carlyn will reveal the many surprising ways your animal friends can enhance your total health - mind, body, and spirit. Carlyn Montes De Oca is an award-winning author, international speaker, acupuncturist, plant-based nutritional consultant, and passionate animal advocate with a bachelor’s degree in Communication Arts and a master’s degree in Traditional Chinese Medicine. Before her career in holistic health, Carlyn worked in the motion picture industry film editing on movies such as Honey I Shrunk the Kids, Alive, & Three Men and a Little Lady. bestselling award-winning book. 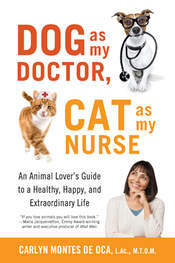 "Dog as My Doctor, Cat as My Nurse, An Animal Lover’s Guide to a Healthy, Happy & Extraordinary Life! " 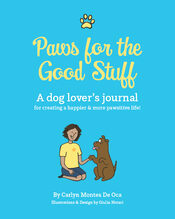 Her eagerly awaited follow-up book, “Paws for the Good Stuff: A Dog Lover’s Journal for creating a happier and more Pawsitive Life,” will be available in October 2018. Carlyn offers workshops, webinars, and health and wellness coaching. As the founder of The Animal-Human Health Connection, she frequently speaks to community groups, animal shelters, non-profits, corporations, and at conferences on the powerful ways we can improve health, happiness, and longevity through our connection to our animal companions. Voted PETA’s Sexiest Vegetarian over 50, Carlyn has also been a spokesperson for In Defense of Animals’ Guardian Campaign. Carlyn enjoys hiking with her dogs, relaxing with her cats, living a vegan lifestyle, and watching super-hero movies. 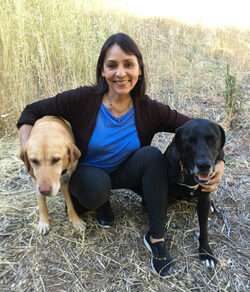 A longtime resident of Marin County, California, she now lives in Santa Fe, New Mexico with her husband Ken, an award-winning sound effects editor at Lucasfilm, and her beloved rescue animals. Carlyn has multi TV, Radio and Press Interviews, you can watch a few of her short TV Videos below in English & Spanish. Subscribe to her You Tube Channel here. She will also have a limited supply of books at an exhibition table at the conference, so if you would like to make a reserve order then please contact her by email at cmdo@AnimalHumanHealth.com to ensure your copy. Or you can pick up your copy at Amazon here. Carlyn would love you to connect with her on social media, links below and you can read more information on Carlyns' website here. What does your dog or cat know about your health that you don't?